How do you Insert a Google Sheets Spreadsheet into a Google Docs Document? How do you Generate a Direct Download Link to Share a Dropbox File? How do you Create a Fillable Template in Google Docs? How do you See who You've Shared Folders With in Dropbox? How do you Manage Inventory With Google Forms and Sheets? How do you Graph Your Unread Email Count in Gmail? How do you Track How Much Time Has Passed on Cards in Trello? How do You Link Data on One Spreadsheet Page to Another Sheet? What Apps Work With Siri Shortcuts, and How to Add New Apps? 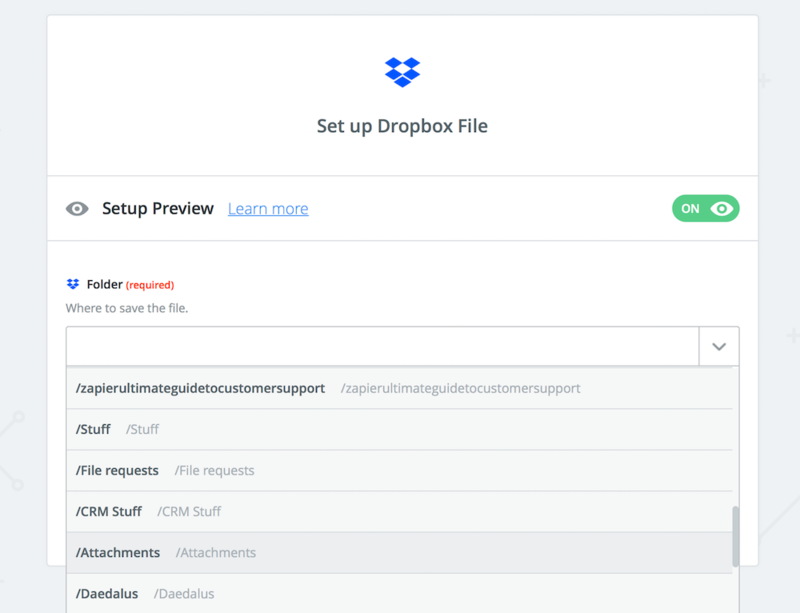 Want an easy way to send files to Dropbox? How about just sending an email to Dropbox with the file attached? Here's how to set that up. In this tutorial, we'll use app automation tool Zapier to make a new email address where you can send files—and then connect that to Dropbox to automatically save every file you forward or email to Dropbox. It starts with a new email address. Click the Use this Zap button on the right or the Create this Zap on the bottom of the page to start building this Zapier workflow, and sign in with your Zapier account or sign up for a free Zapier account if you don't have one already. Zapier will then make a new email address where you can email your files. Add a name you want—we've set dropbox by default so it's easy to remember, but you can change that if you'd like—and Zapier will add a custom, random ending like .1abcd@zapiermail.com to your address. Copy that address and save it to your email address book. Then send a new email to that address with an attached file you'd like to save to Dropbox. 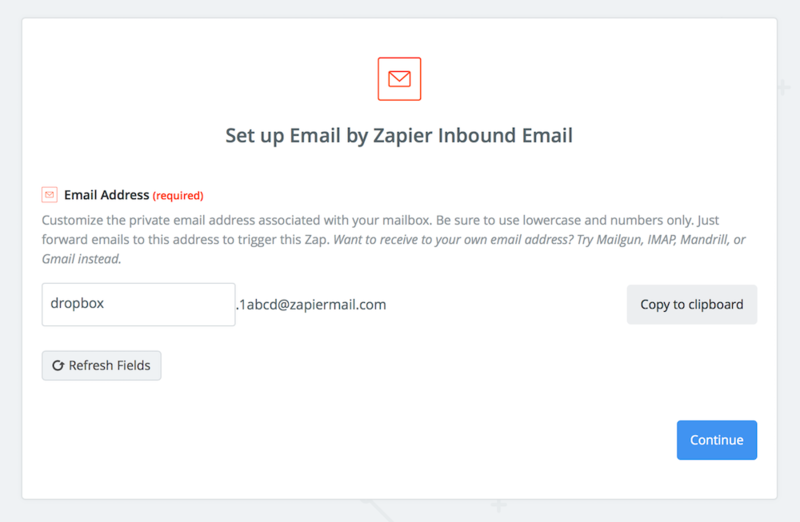 Back in Zapier, click Continue in your Zap to pull in that sample email. Now, it's time to connect Zapier to your Dropbox account. You can then pick the folder where you want Zapier to save the file. Zapier will then automatically copy the file from your email attachment and save it to that Dropbox folder. Note: Most email apps will only let you send files up to 25MB, and Zapier can only add files up to 100MB to Dropbox. Next time you need to save a file to Dropbox—perhaps from your phone, or from a friend's computer where you're not logged into Dropbox—open your email app and send a new email to your Dropbox email address. Attach the file, and Zapier will save it to Dropbox for you automatically. It's also a great way to save attachments. When someone emails you a crucial file, forward it to your Dropbox email address, and Zapier will save it to Dropbox so it's ready when you need it. → New to Zapier? Learn more in Zapier's Getting Started Guide. Then find more ways to build custom email automations in our Email by Zapier guide.